The Holidays are upon us and as usual, they are going to FLY by! Last year, we visited Ruidoso, NM during the week between Christmas and New Year and had a blast photographing families in the snow. 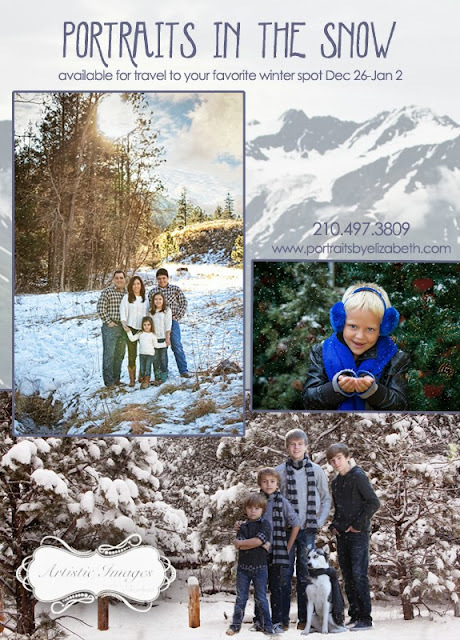 Since we RARELY see snow in San Antonio, this is such a fun and exciting session that will capture some fabulous family memories! This year, we are opening it up to any location that YOU would like to go to...Colorado, New Mexico, Utah....or whatever your favorite winter spot is! I need TWO sessions to make a destination happen. So if you and another family are traveling together, and you BOTH want to do portrait sessions. I can make it happen. You need to act fast as reservations need to be made! Call us asap at 210-497-3809 if this is something that interests you! And who knows? A SNOWBALL fight might happen!